interim results (known as interims): usually reported about eight months into a company’s financial year, they relate to the un-audited headline figures for the first half of the company’s year. These announcements are watched very carefully and have the potential to significantly move the share price of a company. 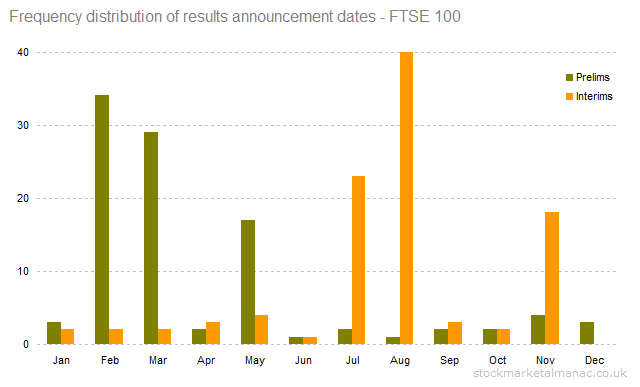 The following chart plots the frequency distribution of the dates of the interim and preliminary announcements for FTSE 100 companies. 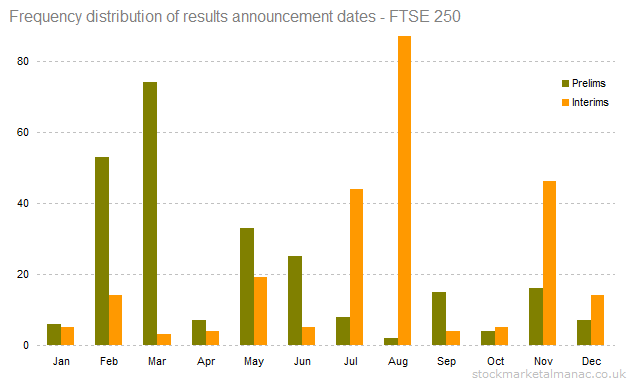 The following chart is similar to that above except this time the companies are in the FTSE 250 Index. February/March the busiest for the prelims. 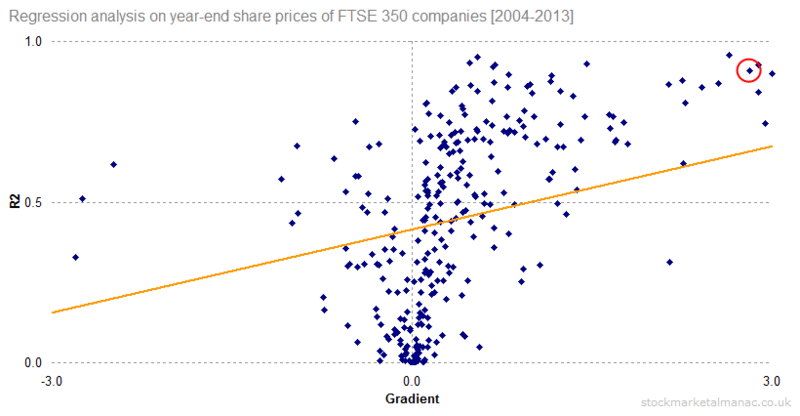 The chart below was created by taking the 300 FTSE 350 companies that have seven or more year’s historic price data and then using regression analysis to calculate the slope of the regression line and the R-squared for each of the 300 companies’ year end share prices for the last ten years. These 300 pairs of figures (i.e. a gradient figure and R2 for each company) were then plotted on a scatter chart (below). The above chart is interesting. A line of best fit has been drawn which has a positive slope, which indicates that shares with higher returns tend to also have higher R-squareds (i.e. lower volatility around the trend line). This is a Good Thing – this is what investors want: shares with high returns and low volatility. Shares are therefore attractive in the top-right quadrant of the chart above (i.e. shares with positive returns and R2 over 0.5). An example would be Rotork (circled in the chart) with a slope gradient of 2.82 and R2 of 0.91 for its year end share prices since 2004..
To identify shares in the top-right quadrant we can calculate the multiple of the slope gradient and R2 and rank shares in descending order by this value. The following table shows the top 20 shares in the FTSE 350 Index as ranked by this multiple of slope gradient and R2. 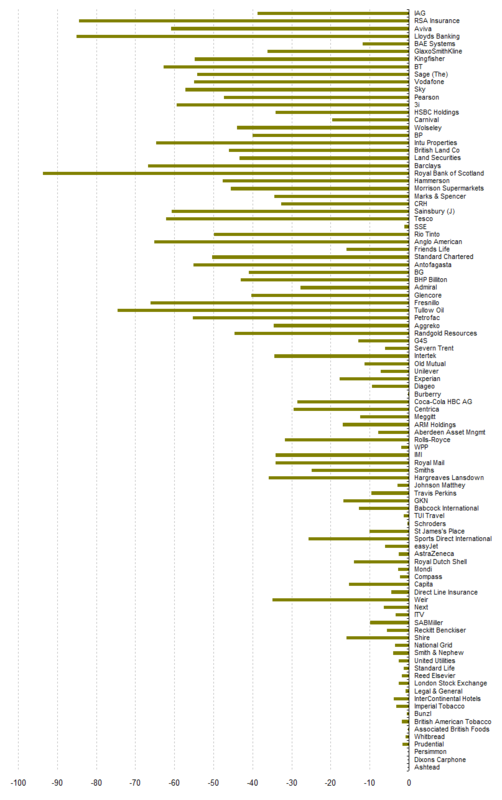 This is, in effect, a ranking of the highest-return/lowest-volatility shares for the past ten years, and as such they might be regarded as the best trending shares over that period. Do shares exhibit a momentum effect from one month to the next? 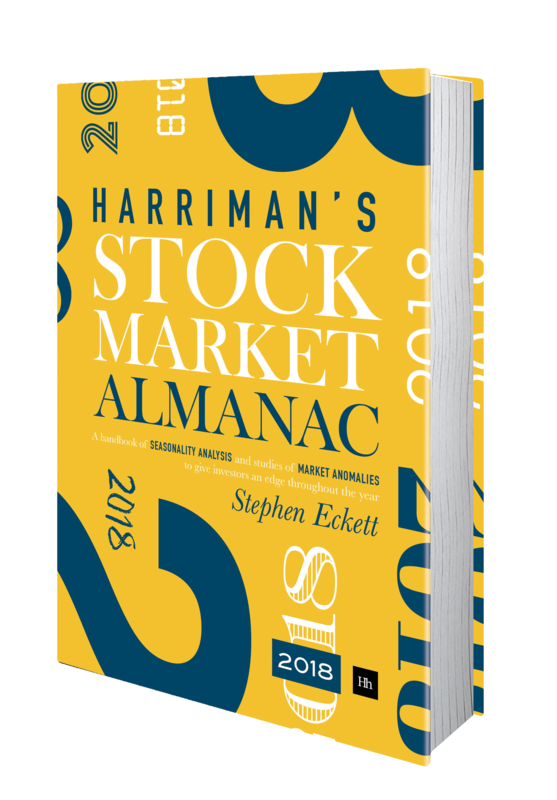 If we selected the best performing shares in one month and created an equally-weighted portfolio of those shares to hold for the following month, would that portfolio out-perform the market index? Or, more interestingly, if we did this systematically every month (i.e. 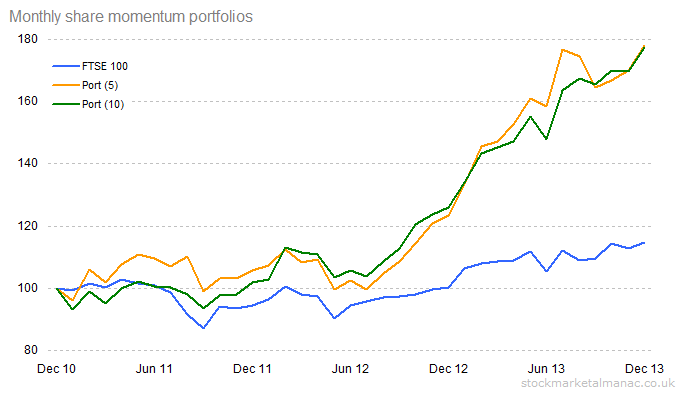 our portfolio each month is comprised of the best performing shares in the previous month), would that portfolio out-perform the market? Both portfolio values have been re-based to start at 100, as has the FTSE 100 Index included in the chart as a benchmark. By mid-2014 the momentum Port (5) would had a value of 176, the momentum Port (10) would had a value of 178, compared with a value of 114 for the FTSE 100.